It was 4am, we’d had little more than 4 hours sleep, on gravel with a thin foam mattress for comfort and a small tent for shelter. But despite this, there was a buzz in the air. This was what the moments before the starting pistol must surely feel like. People chatted and joked in dozens of languages but universally in the manner of excited children. Over one and a half hours were spent in this way, but rather than diminishing the anticipation, the time only added to it. At a few minutes after 5:30, a light came on a few metres up ahead, the crowd hushed and then, slowly, surged forward. The gate was open! The cursory glance at the passport and the final of 4 stamps on our ticket and we were off. It wasn’t the slow and steady pace of previous days. Nor was there the usual banter. Today we were single minded. The pace was fast, faster than would have been possible at any other point on the trek. Moments later we caught up with the group in front, demolishing their 4 minute head start. Speaking Spanish and wearing Argentinian football shirts, their slow pace riled us. The path was too narrow to pass and it seemed our bid to reach The Sun Gate for sunrise would be dashed. Suddenly our guide made his move and, seeing a native Peruvian edge past, the Argentines assumed it was someone official. Pouncing on their confusion, a group of six of us edged passed. Their annoyance was clear and my childish excitement spilled over; “ha ha, we have The Falklands” I muttered as our group resumed our frantic, near jogging pace. The steps were steeper and more numerous than any encountered on previous days, but we bounded up them and could now see our guide standing at the top, the finish line. People began to wane and words of encouragement were shouted – it was like the Army, but without the bullying or fear of becoming cannon fodder. Perhaps it’s too many issues of National Geographic, or watching Indiana Jones with such a frequency, but I couldn’t help but feel a slight disappointment that the citadel hadn’t been revealed to me with a swipe of a machete and the falling away of foliage. Instead, tired and slightly out of it, we stumbled through The Sun Gate, a centuries old archway on a high ridge overlooking Machu Picchu. We stopped and stared, not fully comprehending that we were there, we had made it and we had beaten hundreds of others to it. And yet, it was still more than a mile away. The buildings were still just dots in the distance, the small hills and the peak of Huayna Picchu looked wrong, the angle wasn’t right! It took yet another hike, this one largely downhill and lasting a mere 40 minutes, before we found ourselves amongst the buildings themselves, impossibly well built, with masonry work that seems to elude all but the best craftsmen today with the most sophisticated tools, let alone the Incas, with nothing more that other rocks, wood and sand to carve these huge stones from. And then it came, the moment I, if not everyone else had been waiting for… our guide pointed to a large boulder protruding from one of the countless terraces. 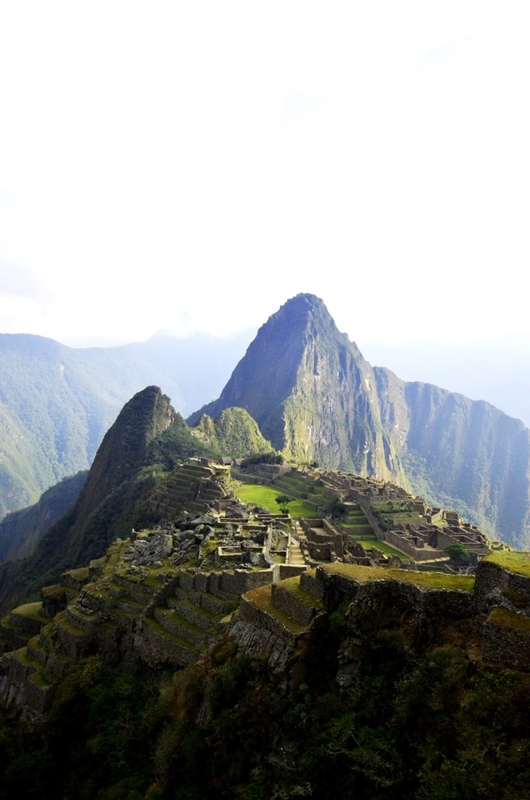 I stood right on the edge, looking out over Machu Picchu, my camera glues to my face, my right index finger in turn glued to the shutter release. This was the “classic view”. There was nothing new about it – since 1911 there must have been thousands of photos of it, now seen by millions of people. It was instantly recognisable the way few places in the world can be. It was utterly familiar and yet different. This wasn’t a photograph or a video, it was real and it was in front of me.